Watching young people grow is fascinating and exciting, and guiding them in this growth is a privilege and joy. The best teachers know both their content area and their students well. They are flexible and responsive to student need, yet sure and steady in their commitment to help their students grow in key knowledge, understanding, and skills. They are passionate about their work and strive to give their best to students every day. Watching teachers grow is just as fascinating and exciting. Professional development that helps teachers expand and refine their practices over time affects both the individual teachers and the hundreds of students they work with over the course of their careers. Therefore, like their students, teachers should have guidance from educators who understand both their content (best-practices teaching) and their students (staff development participants). Our teachers deserve the very best staff development we can offer—staff development that is flexible and responsive to teacher variance, yet firmly committed to teacher growth. All of these complaints often lead educators to feel disillusioned, resent staff development days for the time they take away from the classroom and planning, and take an overall attitude of, "If I just close my eyes, this new initiative, too, shall pass." What is high-quality staff development? What is the relationship between high-quality differentiation and high-quality leadership for differentiation? High-quality professional development leads teachers to gain and refine knowledge of both content and pedagogy. High-quality professional development reflects best practices in teaching and learning, helping adults with varied interests, learning profiles, and readiness learn to work together and feel part of a community of learners. High-quality professional development has a positive impact on the classroom in terms of both teacher effectiveness and student learning. By focusing our staff development efforts around these key principles, we hope to provide administrators and teacher leaders with tools to plan for, implement, and reflect on high-quality staff development that introduces, models, and encourages teachers' continuing journeys along the road to more fully differentiated classroom practices. Change is imperative in today's classrooms. The focus on school change must be classroom practice. For schools to become what they ought to be, we need systemic change. Change is difficult, slow, and uncertain. Systemic change requires both leadership and administration. To change schools, we must change the culture of schools. What leaders do speaks with greater force than what they say. Change efforts need to link with a wider world. Leaders for change have a results-based orientation. This action tool offers teacher leaders tools to facilitate the change process, reminding them that teachers will be at varied levels of readiness for change and, consequently, for staff development on differentiation. Furthermore, we must consider and respond to teachers' interests and, most particularly, preferred ways of learning if we wish them to accept—and even embrace—change. While there are certainly differences between kindergarteners and practicing teachers that require variations in teaching practices, good teaching is good teaching. Savvy teachers have always incorporated differentiated practices into their teaching repertoires to a certain degree, whether or not they have called those practices by that name. The trick is to refine and add to those practices over time. If good teachers believe in and strive to increase the amount and kind of differentiation that is evident in their classrooms, then staff developers must do no less. In other words, if we are asking teachers to differentiate, then we must differentiate for teachers! 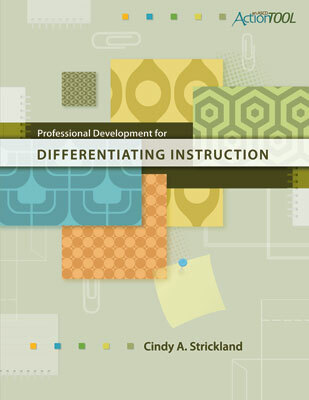 The key principles of high-quality differentiation include establishing a welcoming and safe classroom, ensuring that what is taught (the curriculum) is of the highest quality, maintaining a commitment to ongoing assessment, offering respectful differentiated tasks, and incorporating flexible grouping practices over time (Strickland, 2007). High-quality differentiated staff development must reflect these principles as well. Differentiation requires sustained motivation, hard work, and support from an entire school system. Teachers and administrators must recognize that we do not master differentiation in a day, a week, a month, or even a year. Differentiation is a continuing journey toward expertise in teaching. Just as our students start out at different places in their paths to new learning, so do teachers. To do justice to teachers and to the students they serve, we must accept the need and responsibility to help teachers make this journey, offer the training and support needed to successfully change what happens in the traditional classroom, and find the strength to persevere in our efforts to change without being overwhelmed by the urgency and enormity of the task. If we truly believe that teachers, like the students they teach, have differing learning needs, we must accept the challenge to differentiate professional development systematically and consistently. We can increase the likelihood of this happening by acknowledging teachers' varied readiness levels for new learning, honoring and celebrating their diverse interests, and understanding their unique preferences for how they learn new information and practice new skills. Copyright © 2009 by Association for Supervision and Curriculum Development. All rights reserved. No part of this publication—including the drawings, graphs, illustrations, or chapters, except for brief quotations in critical reviews or articles—may be reproduced or transmitted in any form or by any means, electronic or mechanical, including photocopy, recording, or any information storage and retrieval system, without permission from ASCD.